This geologically and historically interesting walk near the picturesque town of Vries will take you to spots where you can read earth’s history from the surface. The area you’re walking in is part of UNESCO Geopark The Hondsrug, famous for it’s glacial relics. The walk takes you along a number of numbered information signs describing local features. In addition, a large information panel near the main outcrop of the geological monument gives you plenty of detailed information about the local ice-age history. A description of the walking tour can be obtained at the Tourist Information Point, Schultestraat 4 in Vries, and the TIF (Toeristisch Informatie Folderpunt), Herberg Tio, Oude Rijksweg 1. This Link will take you to the digital information flyer. It is hard to imagine that the firm soil of Vries was once covered by the sea. Some twelve million years ago the great Eridanos river started building its delta into the North Sea that covered Northern Netherlands, depositing enormous amounts of sand. Slowly the land emerged above the sea level. In the ditch along the Oostwaterweg the white sand from the Eridanos river can still be seen. In nearby sand pits the Eridanos sand is quarried as building material. Geologists have found out that during the Elsterian ice age the northern Netherlands were covered with ice for the first time. The ice moved in some 475.000 years ago. Remnants from the last three ice ages can be found in the three meter deep sand excavation in the fields along the Oostwaterweg. In the bottom of the soil profile the white sand, dumped by the melting water of the Elster ice age, is neatly exposed. The excavation is a scientific monument or site of special geological interest. 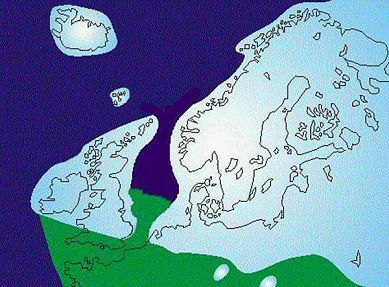 Following the Elsterian ice age and the Holsteinian warm period the ice cover of the Saalian ice agearrived. An ice cap many hundreds of meters thick steamrolled over the northern Netherlands. Southward motion of the Saalian ice shaped the many well-known ice-pushed ridges like the Veluwe, Utrechtse Heuvelrug and Holterberg among others. Also the Hondsrug and its adjacent ridges were formed towards the end of the Saalian, 150,000 years ago, when a fast-flowing ice stream moved from the North Sea to Germany. In between the ridges the stream beds of small rivers like Drentsche Aa and Grote Masloot found their way. When the ice melted, a thick cover of moraine was left behind: a mix of boulders, sand and clay. Geologists call it tillite or boulder clay. In the outcrop of the geological monument a thin string of boulder clay is visible beteween the older and the younger sand beds. The Saalian ice cap transported enormous numbers of boulders or glacial erratics from Scandinavia to these regions. On the side of the Nieuwe Rijksweg in the center of Vries lies a gigantic boulder, weighing maybe 15 thousand kilograms. Many of the boulders stacked near the geological monument were found when a gas pipeline was constructed nearby. The local people have always made use of the local boulders, to build their grave monuments or for the foundations of the medieval churches like the one in Vries. More recently, the sculptor Derk den Boer designed and built the art work called Gebroken Cirkel, which commemorates the find of the ‘Girl of Yde’, a bog interment of a young girl that was found in a nearby peat bog. The monument takes the shape of a labyrinth and is located on the transition of a small brook to the higher ground. After the Eemian warm period the Weichsel ice age arrived (120,000-12.000 yrs ago). The ice cap did not reach the Netherlands, but it was extremely cold; cold enough for the ground to stay permanently frozen (permafrost). The sea level was at least 120 m lower than today, so large parts of the North Sea were dry. Cold stormwinds and blizzards blew the sand across the icy plains, covering the glacial landscape with a thick blanket of wind-blown sand. You can see this “cover sand’ exposed in the upper part of the Glacial Monument. Through cracks in the sub-surface groundwater seeped up into the frozen ground, where it froze and formed lenticular ice bodies, covered with the frozen soil. This way ice hills or pingos originated, which can reach a height of tens of meters. Pingo is an Inuit word for such an ice-cored hill. During warmer intervals the soil cover thawed and slid down the ice body, creating the characteristic circular bank that is often found around the central depression that remains once the ice lens had melted. Usually these ponds are filled up with peat bog. In Holland they are called pingoruins. This walk will take you by the pingoruins of the Holtveen and the Ronde Veen. Five thousand years ago the first farmers settled here permanently. This walk will take you by the prehistoric sites of De Holten and the Welterberg and also the location where the ‘Girl of Yde’ was found. Already in pre-historic times the farmers started clearing the forests to plough their fields. In the Middle Ages this process speeded up under pressure of the growing population and economic demands. Most of the old forests are gone now, but the name ‘Holtesch’ is a reminder of the forest that once covered the area. Also the bottomlands along the brooks were cleared and cultivated for grazing and the harvest of hay. Large herds of sheep were kept on the surrounding heathlands, producing the valuable manure which was essential to fertilize the growing crops. Some of the hills, like the Welterberg, played a role in pagan and christian rites. Until fairly recently in the 20th century Easter was celebrated by girls, looking for easter eggs on the Welterberg. In the early Middle Ages Vries became an important settlement, under the influence of the bishop of Utrecht. The current church, dedicated to Saint Boniface, is one of the oldest, if not the oldest, church buildings in Drenthe. According to some records, the preacher Willehad arrived here around 775 A.D. starting to convert the local people to Christianity. The first wooden church of Vries will have been built here soon after that. The church includes a small museum, showing some relics from the past, including an old bell and the original turret clock movement. - On the triple junction keep left and return to the starting point via the Schultestraat. - Here you can see a typical glacial pond or "collapsed pingo"
- Turn right at the information panel "Meisje van Yde"